Hey everyone, I have posted some of my operation (raid) videos here in case anyone is interested. If you are not raiding yet (or not planning to), this should give you a taste of what raiding is like in SWTOR. If you are raiding already, these videos should give you a different perspective (hopefully) than what you are doing. Updated Jan 27: We are now 5/5 in both Hardmode Karagga’s Palace and Eternity Vault (8 man). Planning to hit up 8 man nightmare modes next week! Added new video for Soa – EV hardmode 8 man. Updated – Feb 2: We are now 4/5 Nightmare EV and 4/5 Nightmare KP*. Videos for these nightmare kills have being added! Check out my guildie’s youtube channel for viewpoints of assassin DPS in our nightmare kills! 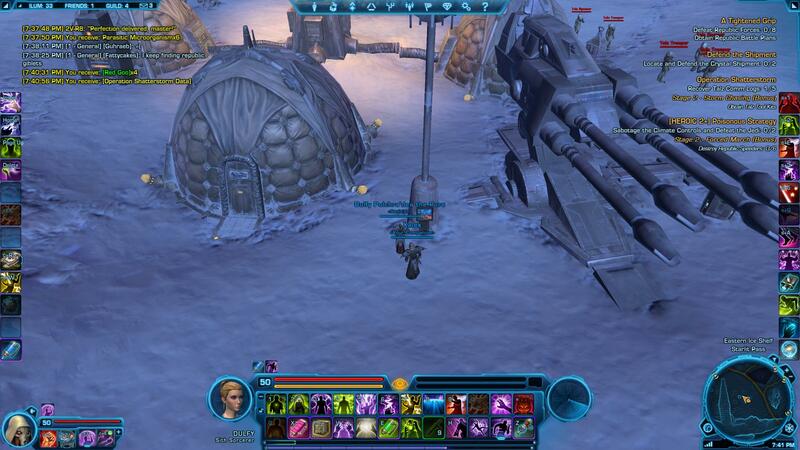 Dulfy just want to say great work on your guides from Rift to Swtor you are a true professional. Keep up the great work!!! Hey Dulfy when u got time could you provide some insight into what classes I should bring in. Like 2heal 2 tank 4dps? and idealy what variations of these roles would u have. I know raw numbers are hard to remember, but do you think you think you could give a rough estimate percentage-wise as to the damage increase between normal/hard and hard/nightmare (if only for a tank)? Actually in terms of raw tank damage, the increase is rather insignificant and not very noticeable (maybe 10-20% increase in tank damage from normal to hard, nightmare is maybe another 20% increase on top of hardmode).. What is noticeable however is the “situational” damage from AoEs, ground effects etc. On hardmodes/nightmare they are alot less forgiving and can potentially one shot an undergeared raider. Also raid bosses do have alot more HP so meeting the enrage timer is also something to consider. If your raid has raiders with good situational awareness and knowledge of their class and they are not terribly undergeared then you should not have a problem moving to hardmode. Nightmare do require abit more gearing. There are exceptions of course. Jarg and Sorno on nightmare hits alot harder than normal/hardmode. I would the estimate the damage increase on nightmare compared to hardmode is about 100%. Dulfy, your guides are great and I have been following your page for a while now. So I have a question. My guild is starting 16 man’s this week. We have been clearing 8 man normals with a core group, and we started doing 8 man hard mode’s. What raid makeup should I be going with for 16 man’s? 8 of them from the core will already be coming in geared. Being 1 tank, 1 dps specced tank, 2 Healers, and 4 DPS. Hey, a general rule is to double everything except for tanks. so 4 healers, 2-3 tanks will be fine and rest all dps. Hey dulfy. Big fan. I was wondering how you got the boss’s health frame to be constantly up above your target. It would be nice to have as most of the time i’m in the dark about what % they’re on unless I target them myself. Thanks and keep up the great content! Hey, it is focus target, target the mob and press alt + f. Keep in mind that when some of the bosses changs phases (i.e. Soa when he goes from phase 1, to 2, or to 3) etc you lose the focus target and have to retarget the mob and do alt +f again! sorry totally forgot about this! If you look on my left hotbar, I have some stuff in weird keys (insert home etc) these are for my mouse buttons. I have a logitech G5 so I find stuff to left scrollwheel, right scrollwheel, increase dpi and lower dpi buttons. Stuff I don’t use often I don’t keybind. Hey Dufly, Can you tell Jay that Jouiss says hello. haha just like him to quit before the good stuff comes out. Just wondering if you have any videos of denova. Cleared normal mode, but still having issues on the two tanks. Trying to get into Hard Mode and am looking for videos with healer perspective. Hey Dulfy, just wondering what software do you use to render these videos?